Discover our superb London conference venues and why the talented Ultimate Experience team can you make the best impression, whatever the theme of your event. One of London’s most iconic year-round conference venues, the Roundhouse is a spectacular 1,300-square-metre blank canvas venue. That means it can be adapted to a broad range of themes, with space for up to 1,500 conference guests. Better still, your guests will get to enjoy excellent views of the Main Space from the Circle Balcony, and world-class service from an experienced hospitality team. What venue could make a better statement than a UNESCO World Heritage Site? The Tower of London, a huge 11th-century castle and the home of the famous Crown Jewels, is one of Britain’s most recognisable landmarks. And The Pavilion is one of the most requested conferences venues London, featuring a spacious dining area and two big screens and projectors. With its good access to the City and the London underground network via Tower Hill tube station (a stone’s throw away), it’s perfect for large conferences during weekdays, weekday evenings, or any other time. 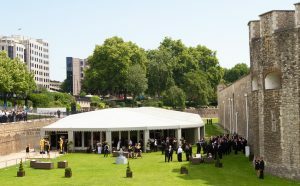 Next to the impressive Armoury House, the Artillery Garden at the HAC is another large winter and summer conference venue that can accommodate up to 2,400 guests. With first-rate sound, lighting and technology, and very easy access to large financial and legal firms in the City, it is well suited to high-profile corporate events. During the Christmas period, the Artillery Garden at the HAC transforms into a winter wonderland, and in the summer the venue holds outdoor events on its spacious grounds. For well over two decades, Ultimate Experience has managed high-impact corporate events in London’s most sought-after venues. We know how important it is for your conference venue to create the best impression, which is why we’re committed to providing you with the best talent and suppliers. Our venues are flexible enough to be adapted to any event brief, no matter how ambitious your idea. This year, our team is managing dozens of conferences, charity events, parties, award ceremonies and other private functions in our large conferences venues London and in other destinations across the UK. Why choose Ultimate Experience for a large conference in London? We are the most popular event management and seasonal venue hire company in London. For more than 25 years, we have provided outstanding events in some of the most luxurious venues in the city, from corporate events to award ceremonies and Christmas parties. What underpins our success is our talented full-time staff and huge network of suppliers, which enables us to deliver on the most challenging of briefs and exceed our clients’ expectations.